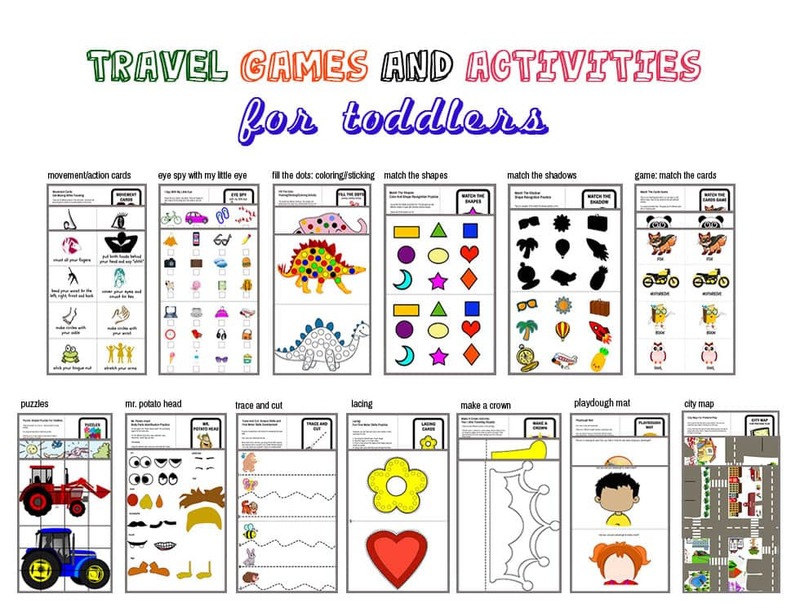 with these 13 travel activities and games! You can not predict what happens on a road trip or in a plane with a toddler in tow. or it could be a normal, stress-free, fun and wonderful trip, with only a sprinkle of a tantrum or two. And how can you stop a tantrum before it happens? 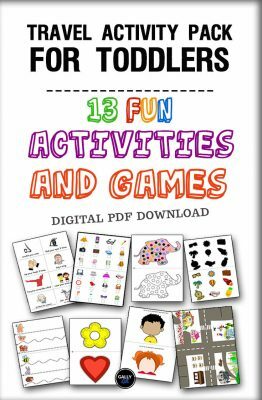 Have fun activities and games ready and get your child busy when boredom begins to creep in. And this is where this travel activity kit for toddlers comes to good use. 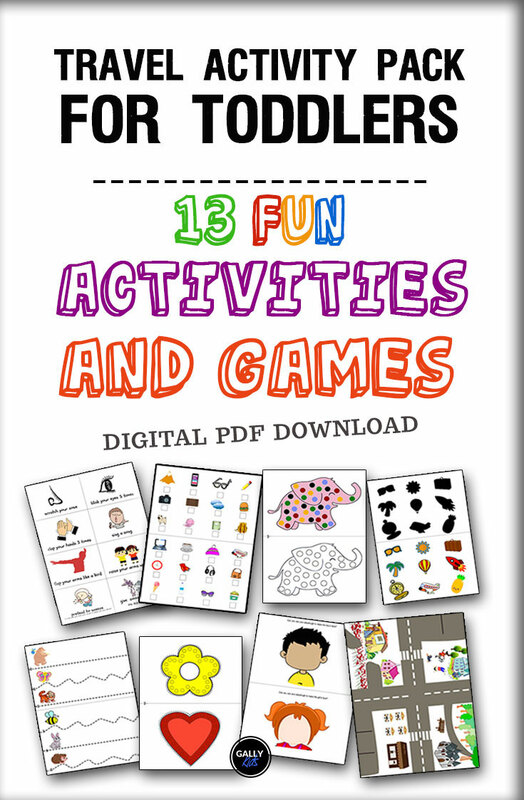 This is a PDF document of activities and games that are great for when you’re out and about. There are 13 activities in the packet. With these activities, your child can make a crown, lace a heart, or stick dot stickers on an elephant (scroll down to see all the activities). This also includes games a toddler can do in a car or a plane like the Movement Game (roar like a dinosaur! clap your hands! etc). This is a DIGITAL DOWNLOAD. When you buy this product, you will receive an email with a link to the download page. We DO NOT send you any hard copy. Scroll down this page to see all the activities. 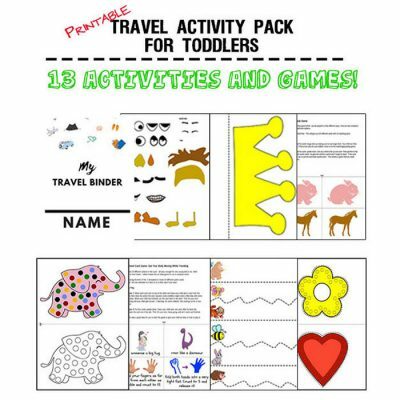 What’s Included In This DIY Travel Activity Pack? You don’t have to use all the activities in this packet. You know your child the best. You might find that some of the activities here are not something your toddler would like to do. For example, coloring was never something my son liked to do at that age. Pick what you think best fits your toddler’s interest and take only the ones that will work for you. 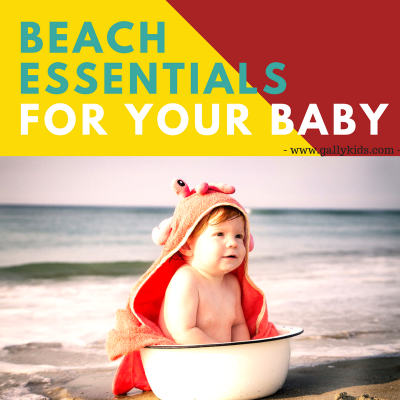 Or you can use them all if you think your little one is going to enjoy them all! Below are some ideas on how you can organize and pack these activities for your trip. Click Here to download and buy now! There are 20 different actions in this card deck – all actions are easy enough for toddlers to do while seated on their chairs. A fun map for kids who like to play pretend. You can use matchbox cars, dolls or dinosaurs for this map. If your child likes this type of make-believe games, this will be played with many times. I highly recommend laminating this to make it last longer. There are images on each sheet of the things your child needs to look out for during the trip. Each image has a box underneath it. Your child can use this to put a check mark if he sees it during the trip. For a little bit more work, he can color the box instead. This activity has different variations. The simplest and easiest way is by using it as a coloring sheet. But you can make this more fun with a few other craft/art materials. Cut across the middle horizontal line. This will give you two different sheets of paper with identical colored shapes. This is an activity for shape and color recognition. Your child plays by matching the cut shape to the one on the sheet of paper. This is a variation of the match the shapes activity. In this activity, the sheet of paper your child needs to match are the shadows of a few fun and colorful images. This is a fun matching game which you can play in a few different ways. These are simple 4,6, 8 and 12 – piece puzzles for young toddlers. 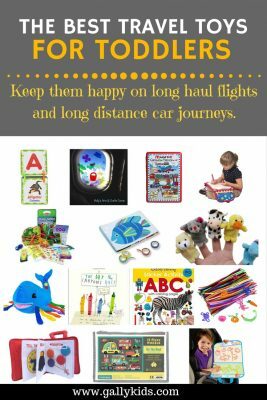 Buy Now for fun educational activities during travels with your toddler! Kids who love Mr. Potato Head will love this! The pieces are small and fiddly so it’s best for older toddlers. A simple cutting/scissor skill activity for developing fine motor skills. Important: you will need yarn and a foam sheet or thick cardboard for this. This is great for fine motor skills development. 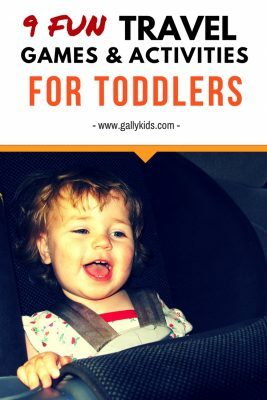 It’s a great busy bag activity for toddlers who have the patience to do it by themselves. These crafts are great quiet time activities! Buy it here. There are two different crowns in this package. The first one is useful for a quick activity. Cut along the edges of the crown as well as the band. Then glue the band on to the crown making sure that it fits your child’s head. 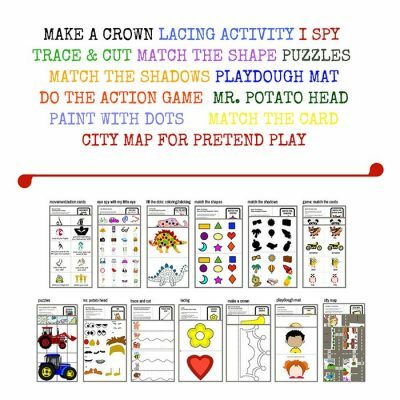 There’s another crown sheet for children who like to draw and decorate the crown first. A fun way to play with playdough. There are 4 different images making 4 playdough mats. Aren’t these fun crafts to do with your toddler? Simply download and print. If you want to pack light, print the document and put the activities in one plastic envelope. Then take out out an activity when needed during the trip. Depending on the activity you’ve chosen, you may need to do a bit of preparation before the trip. For example, for the lacing activity, you will need to cut the heart/flower, punch the holes and make sure you have a yarn. Once you’ve done this, put all the activities in one plastic envelope. And you’re good to go. If you have the time and the patience, you can make a lovely, well-organized travel activity pack with this kit. Put each activity in its own Ziploc bag and then organize them in a binder. Watch the video below to see what I mean. Let go of the organized binder system! How about putting an activity in one Ziploc bag, add in a snack or two and wrap it up? From my experience, nothing gets a toddler more excited than opening presents. I know mine looked forward to it.